As a team member, you’ll get a free copy of Lori Erickson’s new book if you agree to read it and post an honest review on Amazon, Goodreads, and/or other online websites when it comes out in August. We also hope you’ll share your opinion of the book on social media, talk about it to friends, and ask your local library to order it. Westminster John Knox Press will choose 25 members of the Book Launch Team to receive a review copy by mail. Other team members will be sent a PDF of the book via email. Books will be distributed by May 1. 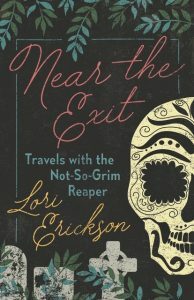 In addition to the free book, when Near the Exit is published Lori will send you a signed bookplate, plus additional bookplates for gift copies if you’d like them. She’s also happy to Skype into your book group if you decide to discuss Near the Exit. If you’re interested in being part of the Book Launch Team for Near the Exit, please sign up below. The sign up deadline is April 20.